So please pop over and enter the comp so we can see your amazing cards. I used a sm sq card and free papers from making cards mag i col with H2Os and the cut the basket out and put on foam pads to give a bit of hight and the i put it on some glitter card i added a bit of green ribbon and a big flower i got from a gift bag. Nice and cheerful colours. 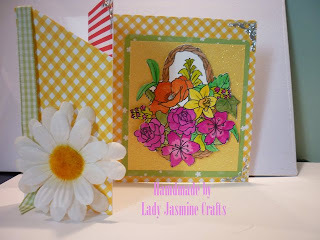 Very much a spring card. It's lovely. This is a fabulous card Nicky, I love the fold on this card and the colours too.